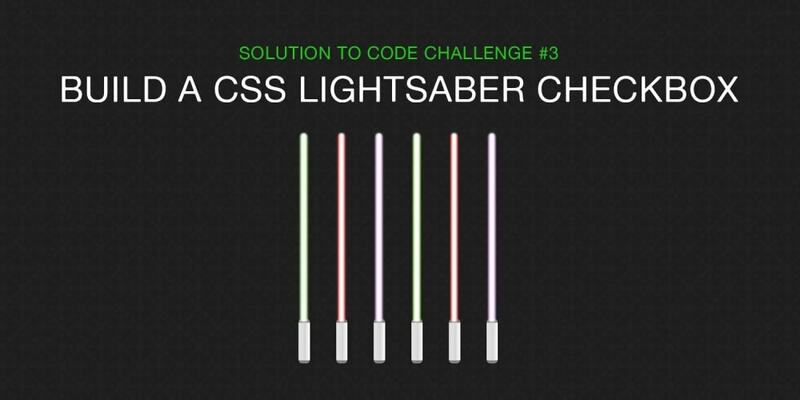 We&apos;ll start with the HTML for just one of the lightsabers. This will be fairly simple and will use some BEM Classes. Now when we click on the label, this will check and uncheck the checkbox. The technique we&apos;ll use here is a simple one. This is the technique used when you see all the styled out radio and checkboxes across the web. We&apos;re going to style the label as our lightsaber and we&apos;ll hide the checkbox. Hide the checkbox. Use the label to toggle the checkbox. Since we are able to use the label to toggle our checkbox, we don&apos;t actually need the checkbox itself. Checkboxes are harder to style out anyway since they come with their own set of base styles per browser. We&apos;ll style the label as the hilt of our lightsaber and we&apos;ll add another div to house the actual plasma/colored part. The BEM style of classes let us know with the double dashes that this is a modifier to the main .lightsaber class. Our lightsaber looks nothing like a lightsaber just yet. The next bit of magic will happen in the CSS. We have our .plasma div that we need to style next. This is the piece that we will show and hide when the checkbox is toggled. This will be the green glowing part for our Yoda saber. Since we already have our HTML checkbox set to the checked state, we&apos;ll style it as if it was on already. Notice that we have added a transition to the height. This is what will get transitioned from 0 height to full height. That&apos;s how we get the lightsaber opening and closing effect. We want this saber to be for Yoda and we have a class specifically for that purpose. We&apos;ll use that to style the green saber. I&apos;ve also added the styles for both vader and windu in there. We will check if the checkbox is checked using the checked psuedo class and then set the sibling .plasma to full height! Now we have this cool whoosh sound! That ends the Code Challenge for this week. Hope you found that helpful and got some CSS techniques out of it. Until next week!